The RG-2500 tipping bucket rain gauge is a dependable instrument used for measuring precipitation. 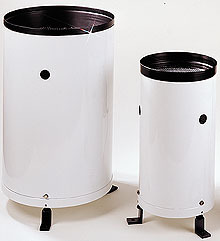 Rainfall that enters the 20 or 30 cm (8 or 12") funnel collector is directed to the tipping bucket assembly. When an incremental amount of precipitation has been collected 0.01", the bucket assembly tips and activates a magnetic reed switch. The sample is discharged through the bas of the gauge. a momentary electrical contact is provided for each increment of rainfall. The contact closure is used to operate a data acquisition system. The RG-2500E is used where 115Vac is available and precipitation is often in the form of snow. A heating kit has been added to the basic RG-2500 rain gauge to provide capability for measuring snowfall. 참고: Comes complete with 7.6m (25') signal cable, mounting feet, and operator's manual. Heated units also include 7.6m (25') power cable. Optional Event Datalogger Software comes complete with 3.7m (4;) RS232 cable with DB9F termination, battery, and operator's manual.